In Myriam Da Silva’s quarterfinal bout, she was faced against American boxer Oshae Jones. While Myriam boxed a good match, Jones came out victorious with a unanimous score of 5-0. Despite the loss, Myriam performed well during the competition and is excited for what the future holds in her boxing career. Irene had received a bye during her preliminaries, therefore making her quarterfinal match the first of her tournament. Despite a later start in the competition, she was more than ready and displayed great and composed boxing skills against Maria Palacios (ECU). 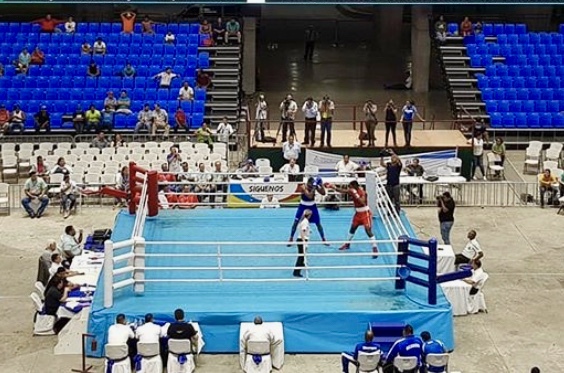 With a unanimous decision win in her opening bout, Irene is now guaranteed a medal and advances to the semifinals where she will face Brazilian boxer Beatriz Ferreira, who is currently ranked 10th in the world for the Lightweight division. This will be a great challenge for Irene as she tries to make her way to the final. Tammara received also a bye for the preliminary round and made her debut in the quarterfinals of the Pan Am Qualifiers. In her first bout, she squared off against Flavia Teresa, one of Brazil’s best middleweights. From the very start of the bout, Tammara set the tone and boxed a great technical match, winning in a convincing manner with a score of 5-0. With this victory, Tammara advances to the semifinals where she will face off against the American Naomi Graham. The pair faced each other last year in Regina during the Ken Goff Memorial Boxing Class where Tammara won the bout. This rematch between both North American boxers promises to be high in action as as Tammara is ranked 4th worldwide while Naomi ranks 5th. Harley-David’s quarterfinal match proved to be very contested and entertaining. He faced off against the Dominican boxer Luis Georges, a southpaw that O’Reilly had dueled with at the Independence Cup earlier this year. Unfortunately, O’Reilly came out on the losing side of a very close 2-3 decision. O’Reilly’s Pan Am Qualifiers experience ends here, but he remains confident in his capabilities for the rest of the boxing season. Sabrina Aubin‘s semifinal match will take place on day 6 (April 9) vs. Leonela Sanchez (ARG). For all information regarding the competition (schedule, results, draw sheets, etc), consult Boxing Canada’s event webpage throughout the tournament. Best of luck to all our remaining athletes in their push to reach the finals in their categories.